Just the word “stroganoff” makes my mouth water. The first thing I think of when I hear that word is the rich, savory, sour cream-kissed silky sauce that envelops all the delicious ingredients within it, spooned atop twisty and tender egg noodles. It’s the perfect one pot meal that soothes the soul and warms the belly, simply prepared with a few basic ingredients, all gently simmered together to create deep flavors without taking a lot of time. Typically stroganoff is prepared with cuts of beef, but I opted to prepare mine with tender and juicy chicken breast for a change. It’s a slightly leaner and lighter version, which cooks quickly as well, after the chicken gets that initial golden-brown sear in the pan. 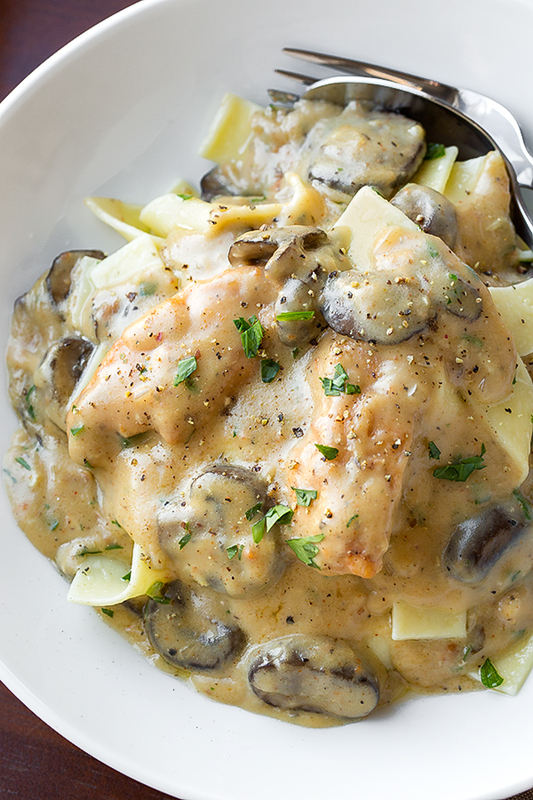 And I love the addition of succulent mushrooms in this chicken stroganoff—they offer a bit more texture and “meatiness”, plus that earthy flavor. And that finishing flourish of sour cream at the end adds in a mildly tangy richness that stroganoff is known for, and you get that uniquely velvety consistency. 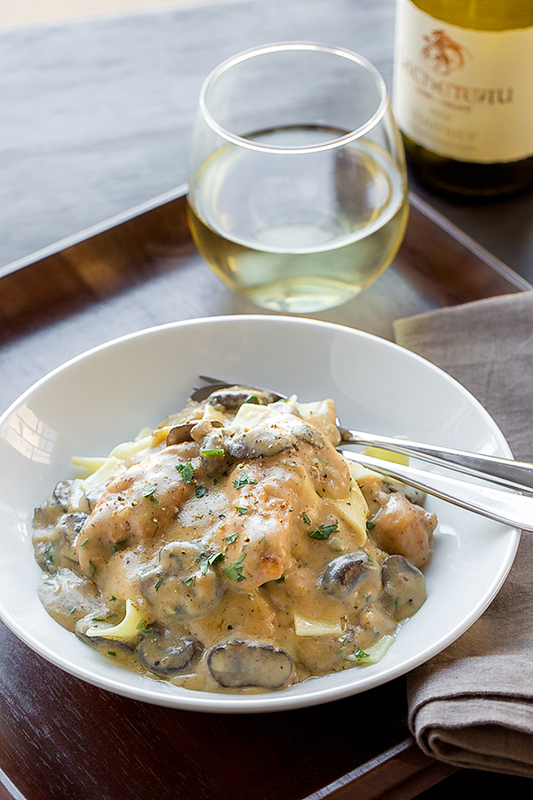 So for a slightly lighter, leaner, and quick-cooking stroganoff (but with all of the flavor you’d find in the traditional version), try this chicken stroganoff instead—a stroganoff with a twist. • Chicken breast or thighs: I personally like to use chicken breast for this recipe, but skinless and boneless chicken thighs would work well for this recipe, as well. • Choose your mushrooms: Crimini mushrooms are a great pick for this recipe, but feel free to use white button mushroom, or shiitakes, or even a combination of mushrooms for a flavorful “mix”. • Egg noodles or rice, your choice: Egg noodles are typically served with stroganoff, but another good option is rice, also delicious. • Sour cream substitute: If you are dairy-free, then you can always sub a dairy-free sour cream in this recipe; or, if you don’t have any sour cream on hand, you can substitute plain greek yogurt, as well. -Add the chicken slices or chunks into a bowl, and sprinkle with a couple of good pinches of salt and pepper, plus the paprika; add ¼ cup of the flour, and toss everything to coat well. 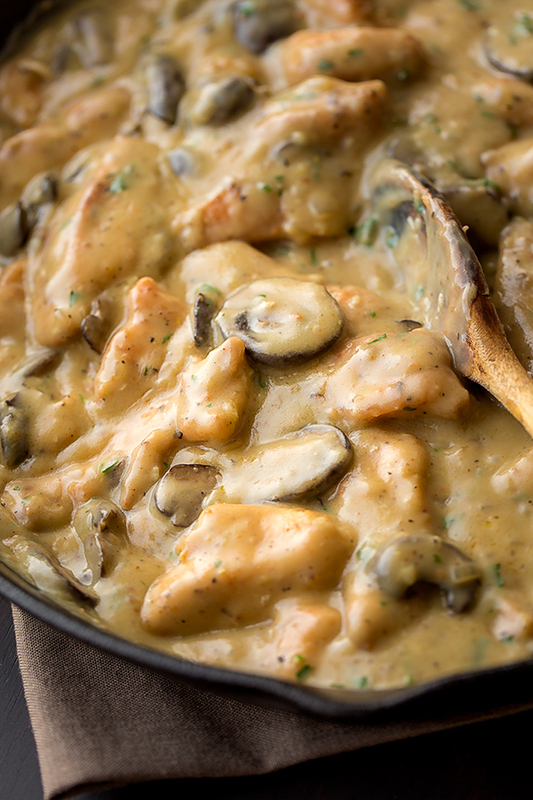 -Into the same pan, add in the mushrooms (you can drizzle in a touch more oil, if needed), and saute those for a few minutes until golden-brown; remove with slotted spoon, and set aside for a moment (you can keep the mushrooms with the chicken, if desired). -Reduce the heat under the pan to medium-low, and add the 4 tablespoons of the butter into the pan; once melted, add in the shallots and garlic and saute just until aromatic; sprinkle in the remaining ½ cup of flour, and stir it into the butter, cooking the mixture for a bout 30 seconds or so. -Next, pour in the chicken stock, whisking all the while to avoid lumps, and allow the sauce to simmer for a couple of minutes until thickened. -Serve over warm, buttered egg noodles, or even mashed potatoes, etc. Editor’s Note: This post was originally published in December 2015 and has been updated with even more love. I’m so happy to hear your son will be able to be home to spend Christmas with you and your husband. It’s a very special time and he’ll have so much to share. My daughter came home from school for her winter break last Friday and I found I had to restrain myself from overly touching her, squeezing her (“Mom!”) and kissing her every time I passed her. Really!! How long will your son be able to spend with you both? For however long, it’ll be very sweet and all 3 of you will treasure every moment. As they grow, and our traditions change a bit – as you’ve talked about in one of your blog entries – it’s a wondrous thing to watch this and enjoy them in an ever-evolving way. Such a gift. For us, we will have Elena home for 2 weeks (too short, really) because she’ll then leave on Dec 26th for a school-sponsored humanitarian trip to Myanmar (Burma). I’m so happy for her, and proud, and wanting to experience it all with her. And I’m also waking up many nights around 3 a.m. with worries of every sort! I’m working hard to keep those in check, knowing thousands of people travel every single day without problems. Still…… So, everyday I make the choice to leave her and the trip in God’s hands. This looks good. We use chicken grilled over charcoal. 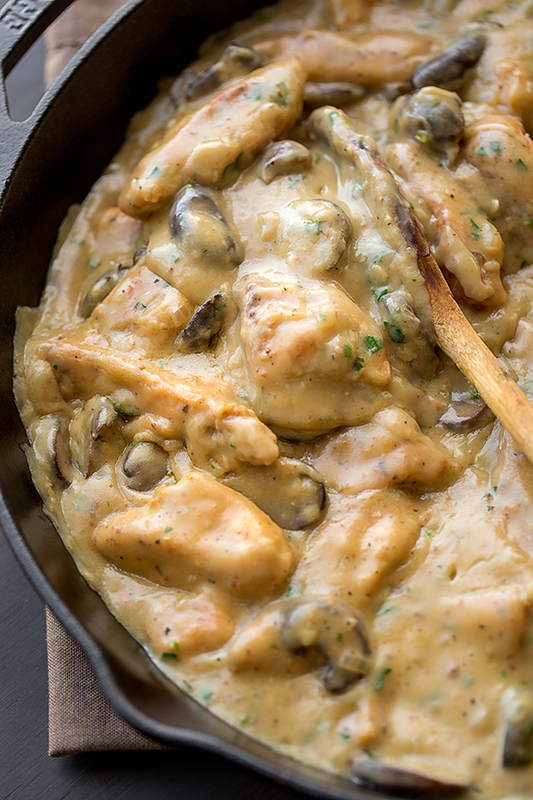 Whenever we we grill, we always try to have extra chicken (or steak) to make grilled stroganoff. It’s super tasty. Mom made it for 150 people, for my brother’s reception. Got rave reviews;) We had everyone asking for the recipe! Fresh garlic is a key ingredient, garlic powder just doesn’t taste as good. Hello, this really looks amazing! I’m not very big sour cream fan and was wondering what can I substitute the sour cream with? Hi Clem, no problem! You can either simply omit it, or substitute some cream or even half and half to give it that creamy-but-not-tangy quality. Hope that helps! Please enjoy. Can’t thank you enough for this recipe, Ingrid! I have always made the beef one, but for some unknowm reason it made me gag, meanwhile your recipe is delicious, the chicken is tender and yummy, grazie! The explanation and the structure of your recipy is very simple to follow! Take care, Martina from Italy! Martina, I’m honored to have you all the way from Italy! I’m thrilled that you enjoyed this, and I thank you for sharing your experience. So glad this was easy to follow! 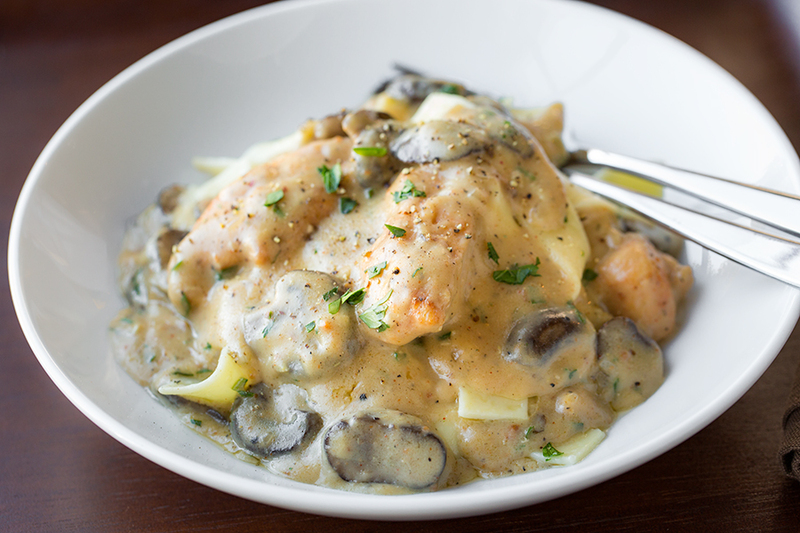 Gave this a go, and I must admit that it’s THE best stroganoff I’ve ever tasted. Thanks for this fantastic recipe. I’ll be back to try out more! Hi Tracy, that is music to my ears! So glad you enjoyed! Yes, I hope you give more recipes a try, and I thank you for taking a moment to comment. While on a trip to khajuraho I had the opportunity to taste this dish made at a Swiss restaurant. My daughter loved it and I always wondered if I could prepare this at home. Now that I have your recipe to follow I think I can and for this I shall always be grateful to you. Hi Sangeeta, thank you so much for such a lovely comment. I truly hope that you give this a try, and that it brings back at least a little taste of what you remember the dish to be! Happy cooking, and may this meal bring you and your daughter a little pleasure and love! I am wondering what you would think about substituting a portion of the chicken stock for white wine? Say 0.5 – 1 cup of white wine and 2.5 or 2 cups of chicken stock? I know if so you’d want to cook off the alcohol. What are your thoughts? Hi Gretchen, I think that a cup may be too much, but you can go with a 1/2 cup just fine, I think. Hope you enjoy! Hope you have a good time with your family always. Subscribing to your blog ! Veena, nothing makes me happier than to know that one of my recipes could in some small way aid in creating a little joy and “togetherness”! Thank you so very much for sharing your experience with me, and I’m thrilled that your hubby enjoyed the dish…hope he has a wonderful rest of his birthday today! Glad you’re subscribing, and I hope you make more of the recipes! Thank you for commenting. I made this for dinner last night and it was wonderful. Easy to make and taste delicious. The whole family enjoyed it and said I need to keep making this for dinner. Hi Jeremy, that is music to my ears! Glad you all enjoyed! Thanks for sharing. Can I make this ahead, refrigerate and reheat it? If I can, would you advise reheating in oven or stovetop? Obviously, I’m not referring to the noodles! Thank you. Hi Mike! I, myself, have made this ahead and reheated it stove top (or even just the leftovers the next day); if it gets a little thick on you, you can add a touch of water, and then check if you need a touch of a extra salt. But very gently reheating on the stove top, stirring gently occasionally, should work just fine. Hope you enjoy! Can I use a little more butter and plain water instead of chicken stock? If not, what can be an alternative to stock, considering it takes too long to prepare. Hi Jayant, the kind of stock I’m referring to here is one that is store bought; you’re right—homemade does take a long time to prepare, and is delicious, of course; but for this I’m suggesting using prepared chicken stock that you can purchase at the market. Otherwise, you would just need to use water and then add more salt/seasoning if you weren’t going to use stock. I made this tonight and it tasted great. Definitely took longer than 15 minutes to cook though but maybe that’s just me. I’ve made this dish 3 or 4 times now, and played with some alterations. I’m sold on the original, but I do add more sour cream in the end. Wonderful dish! Thank you for sharing! Rhian, so happy you’ve been enjoying the recipe! (And a little additional sour cream at the end never hurt anybody 😉.) Thanks for commenting! I have really enjoyed this recipe. Thank you! It’s a comfort dish for sure. Just wondering if I could use cooking cream instead of sour cream for this recipe? Hi Elisa, of course! It won’t have that little hint of tang, but it will add some creaminess. Hi Marlene, a shallot is a lot like an onion, only smaller and more mild. It has a pink-purple hue to it, and sort of resembles a head of garlic, only a bit bigger, and is typically found near the onions/garlic in the market. Hope that helps! Namaste from India. Such a simple and lovely recipe. I made it today and though in the beginning my mom said it was a lot of chicken, I followed your recipe to the T, and all of it! All of it was polished off in seconds. I barely managed to click a picture of it. If you would like to see and comment on my attempt please follow (the link in my name). Thanks again. Hi Avika, how lovely! So glad you enjoyed the recipe, and that there was enough for all of you to enjoy. Happy cooking to you! Hi Todd, depends on what your wife likes! You can always add more garlic, some spice…this really depends on her specific tastes and what she feels she’d like you to add. This is very subjective. Good luck! I make this very often …. just a little tobasco after it has finished cooking, gives it extra tang and adds a little spice. Hi Kanak, thank you for your comment! So glad you’ve been enjoying this cozy recipe, and the tabasco at the end? The thought of that is making my mouth water—sounds great! This became an immediate family favorite! OMG, it is so delicious. I had chicken tenders so I used them and the chicken was so moist and tender. And the gravy is perfectly seasoned and just wonderful. This is really a blue ribbon dish. If you haven’t made it yet, make it tonight. It’s in our favorites rotation but I can’t wait to devour the leftovers! Thank you for sharing such a great dish. Barbara, what a stellar review! Thanks so much! I’m thrilled you and your family have enjoyed this recipe, and I’m so very glad you’ve come on back to share your experience with me as well as others. I used simmered thighs, bone in and removed the meat. I added one more tablespoon of sour cream. I also added white wine and a bundle of fresh herbs to the sauce. I stirred in the chicken at the end, served over egg noodles. Hi Gary, thank you for sharing your experience with the recipe here with me! Very happy you enjoyed it, and your little tweaks/additions sound absolutely perfect. Hi! Just wondering if you have a recommendation for a gluten free flour substitute. Thank you! Hi Jess, you could substitute cornstarch if you’d like. You’d still toss a portion of it with the chicken to coat it before browning it; and then as for thickening the sauce, you’d mix the remainder together with a little water or chicken stock to make it a more of a paste, and drizzle/whisk that in at the end (don’t add it to the butter as you would with the flour). This would be a perfect filler for crepe!